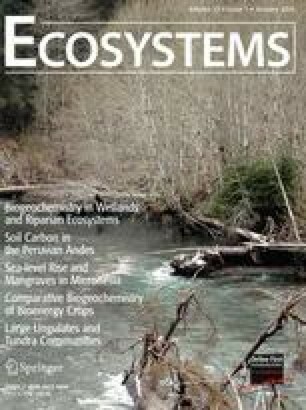 Reliable soil organic carbon (SOC) stock measurements of all major ecosystems are essential for predicting the influence of global warming on global soil carbon pools, but hardly any detailed soil survey data are available for tropical montane cloud forests (TMCF) and adjacent high elevation grasslands above (puna). TMCF are among the most threatened of ecosystems under current predicted global warming scenarios. We conducted an intensive soil sampling campaign extending 40 km along the tree line in the Peruvian Andes between 2994 and 3860 m asl to quantify SOC stocks of TMCF, puna grassland, and shrubland sites in the transition zone between the two habitats. SOC stocks from the soil surface down to the bedrock averaged (±standard error SE) 11.8 (±1.5, N = 24) kg C/m2 in TMCF, 14.7 (±1.4, N = 9) kg C/m2 in the shrublands and 11.9 (±0.8, N = 35) kg C/m2 in the grasslands and were not significantly different (P > 0.05 for all comparisons). However, soil profile analysis revealed distinct differences, with TMCF profiles showing a uniform SOC distribution with depth, shrublands a linear decrease, and puna sites an exponential decrease in SOC densities with soil depth. Organic soil layer thickness reached a maximum (~70 cm) at the upper limit of the TMCF and declined with increasing altitude toward puna sites. Within TMCF, no significant increase in SOC stocks with increasing altitude was observed, probably because of the large variations among SOC stocks at different sites, which in turn were correlated with spatial variation in soil depth. PM, MRS, AG, KJF, MBB, MZ designed the study; MRS, AF, AG, DHU, MBB, KJF, KCG, GCD, WRF, BPG, WTJ, KMK, ATM, NMQR, BTS, FZ, MZ performed the research; MZ, PM, MRS, AF, AG, YM, DHU analyzed the data; and MZ, PM wrote the paper. This study is a product of the ABERG consortium (http://www.andesconservation.org). We thank the Blue Moon Fund and the Gordon and Betty Moore Foundation ‘Andes to Amazon’ Programme for support. We especially thank Manu National Park and the Peruvian Instituto Nacional de Recursos National (INRENA) and the Amazon Conservation Association (ACCA) for allowing access to their sites. Luis Imunda Gonzales and students from Wake Forest University and the Universidad San Antonio de Abad, Cusco were essential for the completion of this project. Zimmermann M, Meir P, Bird MI, Malhi Y, Ccahuana A. 2009b. Climate dependence of heterotrophic soil respiration from a soil translocation experiment along a 3000 m altitudinal tropical forest gradient. Eur J Soil Sci. doi: 10.1111/j.1365-2389.2009.01175.x.